Artisan's work suit 04100 D59 300g SABS. Long sleeve with hemmed cuffs * 2 Breast pockets with flaps and stud closure * 2 Side pockets with side vents * Hip and rule pockets * Button fly. Boiler suit / jump suit. This is a durable overall in a one piece boiler suit style. This means it will cover your body from the neck down to your ankles and wrists. It comes in navy blue and royal blue colours this is a general purpose extra heavy duty warmer overall as it is made from the thicker 300gm material making the overall last longer and insulate more. It has been SABS tested and approved so you can be assured that it is made to the highest standards of quality. It is a tough durable and will last you a long time. It is ideal in any working environment requiring regular protection. This overall / boiler suit is 100% cotton so it is breathable, warm in winter and cool in summer, it has buttons to close the front, making it breathable and adjustable for your comfort. 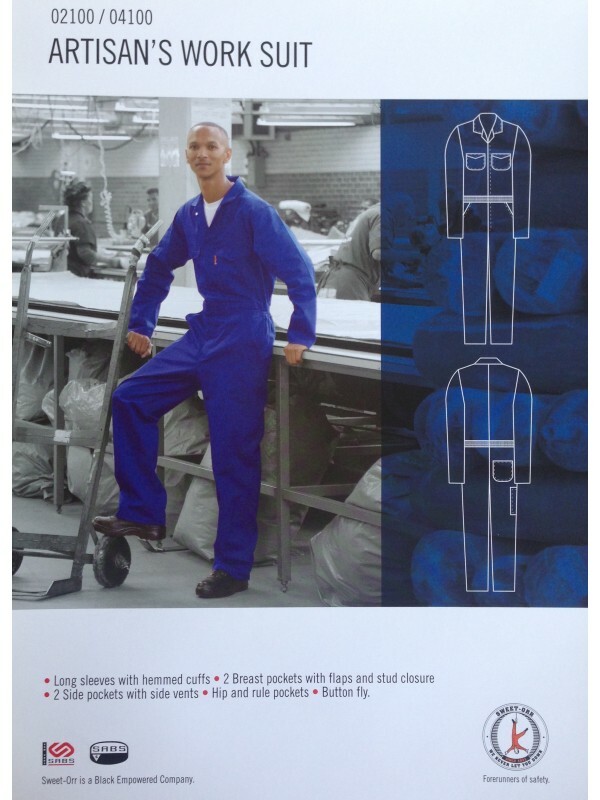 The boiler suit / overall is made from a 300gm material and is SABS quality approved. if you have any questions please feel free to write to us using the contact us page for more information.